Let’s not grade a guy holding the nuclear codes on a curve. With his young presidency bogged down in a series of mostly self-inflicted crises, the bar for Trump’s whirlwind global tour was set so low that if he gets through it with only a handful of minor international incidents, it’ll be considered a success by many observers. But let’s not grade a guy holding the nuclear codes on a curve. Three days into the trip, and Trump’s already shown the world that the United States is being governed by a brittle man-child. And if he manages to get through it without causing a major international incident, it will only be because foreign leaders have done a competent job dumbing down any complex diplomatic issues that may arise and feeding the insatiable ego of our embarrassment in chief. Prior to the trip, foreign diplomats advised their governments to speak slowly to Trump and make sure to use only small words. That’s a slight exaggeration, but Peter Baker reported for The New York Times that “foreign officials and their Washington consultants say certain rules [for dealing with Trump] have emerged: Keep it short—no 30-minute monologue for a 30-second attention span. Do not assume he knows the history of the country or its major points of contention. Compliment him on his Electoral College victory. Contrast him favorably with President Barack Obama. Do not get hung up on whatever was said during the campaign. Stay in regular touch.” The rest of the world appears to have concluded that our president is an idiot. Trump made clear that he won’t even pay lip service to human rights, breaking precedent. Anyone who’s traveled with small children can tell you that being in unfamiliar places can be stressful. You have to do whatever you can to make them feel at home—make sure to pack their blankets and bring along their usual snacks. And so it is, apparently, with at least one 71-year-old real estate tycoon. The AP’s Julie Pace reported that “White House aides were on edge about how the president would take to grueling pressures of foreign travel: the time zone changes, the unfamiliar hotels, the local delicacies.” As a result, there’s been “a worldwide effort to accommodate America’s homebody president,” which includes serving him well-done steaks slathered in ketchup wherever he goes. Nonetheless, after two days of travel, Trump—who repeatedly called both Jeb Bush and Hillary Clinton “low energy”—skipped a scheduled event because he was “just an exhausted guy,” according to an aide. Last week, The Washington Post reported that the president “eschews exercise because he believes it drains the body’s ‘finite’ energy resources,” so perhaps it could have been worse still. In any event, “NATO is scrambling to tailor its upcoming meeting to avoid taxing President Donald Trump’s notoriously short attention span,” according to Foreign Policy, and Trump canceled a planned trip to Masada, ancient fortifications where Jews faced off against the Roman army 2,000 years ago, because the Israeli military wouldn’t let him land a helicopter on the fragile archeological site. Gen. H.R. McMaster, Trump’s national-security adviser, is tasked with babysitting this erratic character through a difficult trip, according to CNN’s Jake Tapper. But a source told Tapper that “it can be difficult to advise the President effectively given his seemingly short attention span and propensity to be easily distracted. You can’t say what not to say,” the source said, “because that will then be one of the first things he’ll say.” Trump seemed to confirm that on Monday, when he told Israeli reporters, “just so you understand, I never mentioned the word or the name Israel” to the Russians when he shared highly sensitive intelligence with them in the Oval Office two days after firing his FBI director. With what seems like some bad advance work—who thought the image of Trump and a bunch of Saudis laying hands on that weird glowing orb was a good idea?—and the tour generating headlines like, “People Here Think Trump Is a Laughingstock,” all of this might seem almost comical. At times, it is: On Monday, Trump told a group of Israelis that he “just got back from the Middle East.” But even if, on the surface, the Donald Trump show should be accompanied by “Yakety-Sax” on a loop, the substance of what Trump’s doing on his road trip is no laughing matter. 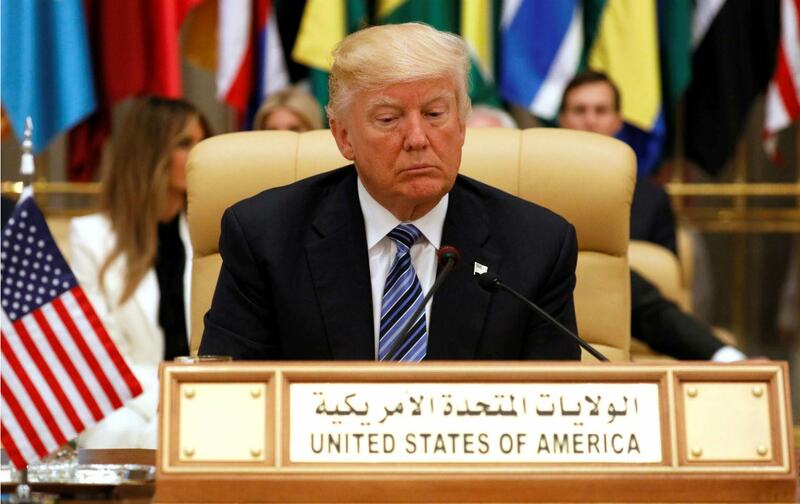 As he was preparing to depart for Saudi Arabia, the Saudi government was working behind the scenes at the United Nations to quietly block a Trump proposal to impose international sanctions on the Saudi branch of ISIS. But that didn’t deter Trump from announcing, once he arrived in Riyadh, that the Saudi sovereign wealth fund would invest hundreds of billions in US weapons and infrastructure—a big chunk of which will land in the hands of an investment company run by one of his “top supporters,” according to The New York Times. In part, this was about Trump’s desperate need for a win, but it also reflected a significant shift in US policy in the Middle East. The Saudis had felt that Obama was too even-handed, and too willing to seek détente with Iran, and had desperately wanted a “reset” in relations with the United States that would put us firmly on the Saudi side of its toxic rivalry with Iran. Trump’s address aligned his regime with the Saudi view of the region, where stability is more important than niceties about human rights or civil liberties. He made clear that he won’t even pay lip service to human rights, breaking precedent with past presidents of both parties. That massive weapons sale will likely lead to increasing bloodshed in Yemen, where, as Jared Malsin reports for Time, a “Saudi-led airstrike campaign has hit numerous schools, hospitals, factories, and other civilian targets, leading to well-documented allegations of war crimes by human rights organizations. The war has also pushed much of the country to the brink of starvation, with more than 17 million people facing famine.” Malsin adds: “the American Bar Association’s Human Rights Center argued that continued arms sales are illegal under American laws that ban sales to states that violate international law.” The Saudis appear to have gotten their reset, and that’s quite a lot of payoff for giving Trump a glitzy reception and heaps of praise. So while we might laugh at his awkward dance moves or marvel at his capacity for malapropisms, we need to keep in mind that it’s really not funny at all that the president of the United States is a national disgrace. Listen to Joshua Holland on the Start Making Sense podcast.